Altona Mowers has been a ‘stayer’ in its local community, according to co-owner Greg Loft. In a time where local mower shops are thinning in numbers, Greg explains how moving with the times and increasing the sales floor has led to dramatic improvements in his business, and voices his concerns for the future of the industry. Altona Mowers has undergone several significant transformations since it first opened as a combined hardware store and mower shop during the Sixties. 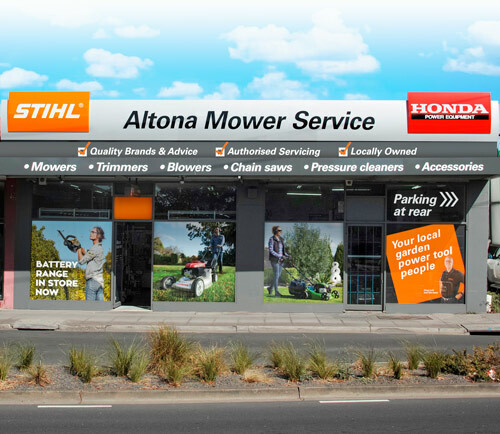 Originally named Dependable Mowers and located in Essendon, Victoria, the shop’s current co-owner Greg Loft, says the previous owners eventually moved the shop to its current location in Altona North, where it occupied a tiny single-fronted shop and was renamed to ‘Altona Mowerpower’. “When I visited the business back in the Eighties before I bought it, it was that cramped that the guys used to have to do the repairs out on the front footpath. It was an incredibly messy looking business, but that was just due to lack of space – but it was very viable,” Greg said. “But the shop has evolved to something different, only because it had to,” he said. 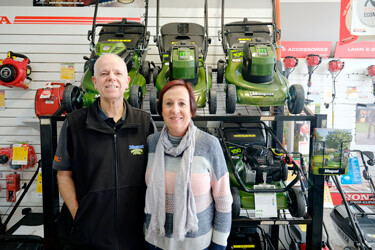 Greg and Joanne chose to expand the business to keep up with consumer needs, with a double store frontage and renaming the business to ‘Altona Mower Service’. “People can’t walk into these shops and just expect repairs. They want to be able to buy product as well. And obviously if their equipment is unrepairable then you need to have something to sell them. So I ended up moving into the second store, which is next door,” Greg explained. He said that the expansion increased retail floor space by four to five times its original size, which made it a totally different business, particularly in regard to the brands it stocks. Masport, and particularly its lawn mowers, has played a significant role throughout the shop’s extensive history, and continues to be amongst his best-selling mower lines. “This business really started selling Masport probably almost from day one,” he said. “I do buy a lot of Masports before Spring. We have a pre-season situation where I usually buy 70-80 mowers and sell them over the season. I’m by no means a big dealer but I do support Masport pretty heavily,” he said. But Greg explained that the expansion meant being able to take on more brands. “It looks a lot more professional than it did, but that’s also due to the fact that we’ve taken on STIHL in October. It’s been a mammoth challenge but it has increased retail dramatically just through the brand,” Greg explained. Owners Greg and Joanne Loft. Given the shop has been established for 30+ years, Greg reports that it is highly recognised amongst several generations of local families. “We’re pretty much on our third generation of people coming through; and often people drive from outer areas to come here because they know this business pretty well,” he said. He explained that the local community in Altona and surrounds is mostly affluent, and people take great pride in looking after their yards; but that traditional customer base is expanding. “This business sort of built its backbones on those people,” he said. But like most OPE dealers, Greg knows that hiring new staff in the OPE industry is not easy. Prior to purchasing his own dealership, Greg completed his apprenticeship as an automotive technician and went on to became a TAFE instructor. He says that after being in the TAFE sector for a number of years, he can see the way the industry has diminished in regard to new recruits, and believes that Australia really needs to re-embrace trades, particularly in OPE. “I’m a bit passionate about it, but I’d love this industry to keep going. But we need to try and encourage young people into it. Whether that’s a government-driven initiative, I don’t know,” he said. “I’ve always said, and I know it’s wishful thinking, but I wish that all the major companies would have banded together as a group to actually advertise to the masses about the power equipment industry; not just flogging their own boat, but about generally coming into these types of businesses and these shops. It’s never going to happen, but it would have been good if they had have pooled money and did that,” he said.